Find tips and tutorials on using the Aura Frame and answers to frequently asked questions. Search our Help Center or browse popular topics and videos below. 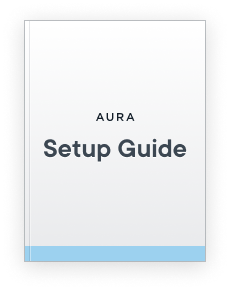 Our printable Setup Guide will take you through the steps with easy-to-follow instructions, plus tips for using the Aura app with your new frame. How do I set up my new Aura frame? How do I use Aura's Gift Setup feature? How do I invite others to join my frame? How do I edit the photos on my frame? Watch how Aura automatically adjusts to its surroundings in this video about how the frame's sensors work. How do I use gesture control? Watch our short video to see Aura's gesture control in action, plus learn tips on how to change photos on your frame with the wave of a hand.